White sand beaches, palm trees blowing in the wind and waves crashing on the shore is what most likely comes to mind when one thinks of Maui. What you might not be aware of is the gorgeous country side that sits up in the mountains with brilliant views, lush green grass and rolling hilltops. In its beauty is where Priscilla and Andrew set their nuptials in what we call Upcountry. The photo booth was rented from https://insideoutbooth.com/. High above the island’s bustling tourist areas in the small community of Kula, is the home of Andrew’s father. The couple thought it the perfect place to host their rustic wedding. The pasture was large enough to fit their 200 plus guests and it encompassed the feel they were going for, a fun, beautiful upcountry wedding. Super happy to be a part of the day and being able capturing images we don’t always get as so many decide to wed by the sea. It’s one of the things we love most love about Maui, the diversity in the landscape. Ocean, sand, jungle, mountains and meadows, its all so lovely, those lucky enough to call it home love to share it with those that don’t. Sharing it on their most special day is a great gift to give to a couple like Priscilla and Andrew, as they start a new chapter in their life. Of course, there’s no better person to tell you the feelings of the day better than the bride herself. We asked Priscilla if she wouldn’t mind sharing some memories of her wedding to Andrew with us. She graciously accepted. As Priscilla enjoyed her view of Kula where she got ready with her ladies surrounding her, Andrew had his guys by his side as he prepped for the day at his father’s. With guests arriving shortly, the time had come for the festivities to begin. The day was beautiful and the light was starting to descend, cooling off Kula and creating a stunning glow for a romantic sky. The Kula air and view of Maui is just magical. The only problem was that his dad’s house didn’t have any level land to house the wedding. His father went in with a team of local friends and family leveling both the ceremony and reception sites, measured and flattened perfectly. As we started to brainstorm the theme and decor, I really thought simple would be best. You really don’t need it in Kula…the venue itself is more beautiful than anything we could have made or added. All we really needed was to build the structure, ensure the evening flowed, that the music kept everyone moving, bellies were full and make sure there was a constant flow of drinks. And that’s what was accomplished! I can’t say enough about our vendors. Everyone was so easy to work with and the evening went on without a hitch…or at least not any that I knew of. Our planner, Lauren, was incredibly organized and kept the evening going as planned. I had so much confidence in her that I didn’t even slightly worry. In fact, I hardly thought about the logistics, which is a bride’s dream. I can’t thank her enough for all that she did. And it was her first Maui wedding! Impressive. When looking at the photos taken, I was able to relive the evening, for which I am forever appreciative. Kaua moved around the site as fast as humanly possible…I hardly remember seeing him! He captured all the highlights but mostly the love and fun that was being had by myself, Andrew and our guests. The lighting could not have been more perfect, but it was truly his vision that made it all come together. I will cherish these photos forever and will be ever thankful for Kaua. 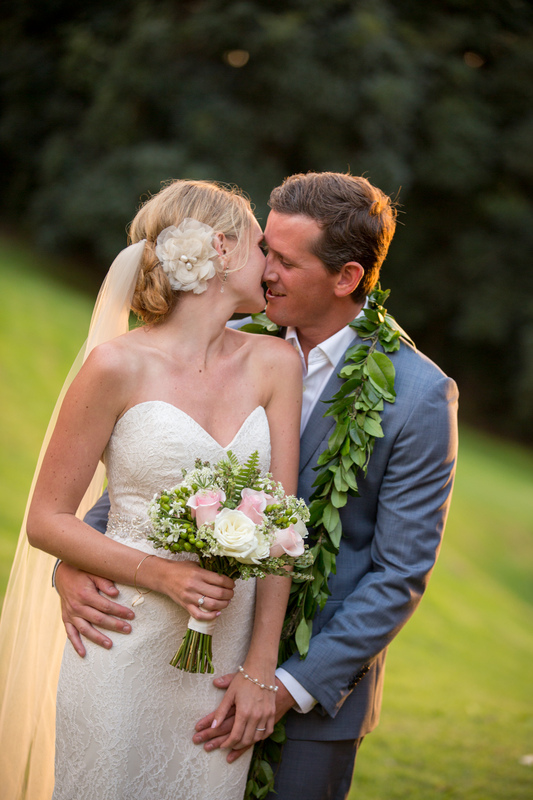 Surrounded by the natural beauty of Hawaii, celebrated by their loved ones with full bellies and flowing libations is the perfect way to start off the journey of marriage. It’s moments like these that keep the love of making others happy, alive. Bringing joy to clients by capturing their most special day and the gratitude they express is endlessly fulfilling. Thanks for inviting us to your great Formal parties. Congratulations and lets do it again in 20 years!